Every USD instructor is encouraged to develop a plan to continue course instruction in case of a university closure during an emergency, natural disaster or widespread illness. This plan will include the use of Blackboard to post course materials, create assignment submission areas, and more. A Blackboard Temporary Emergency Shell is created for every course section at USD. Once the administration notifies ITS of a campus closure, these courses will be activated and available to faculty and students who log in with their mySanDiego credentials at Blackboard Olé. These temporary shells are activated for emergency purposes to faculty who have not previously activated a course on Olé or who have not activated shells for current course(s). Faculty who already have current course(s) in Blackboard will continue using those course shells. Academic Technology Services urges you to take proactive steps by attending a Blackboard Essentials training to learn the basics of Blackboard and how to take advantage of Blackboard's powerful features well in advance of an emergency. Keep in mind that you may create and design your course and upload material and selectively make it available to your students using the Adaptive Release tool. Announcements are used to broadcast messages to members of your class. They will appear on the Announcements page of your Blackboard course and students will be notified via email. Click the Announcements area on the course menu. Click on the Create Announcement button. Enter the announcement and availability information. It is highly recommended that you check the box next to Send a copy of this announcement immediately. Click Submit. Learn more about creating and sending Announcements in the Announcements area of the Blackboard Help site. Choose the content area from the menu or a folder where you would like to upload your syllabus. The default content area is Course Content. Enter a title for the Item. Scroll down, and from Attachments, choose Browse My Computer or Browse Content Collection. Click Submit. Your file is now uploaded to Blackboard. To rearrange items within a content area, while in Edit Mode, hover over the item and click and drag the yellow area (to the left of the item name) up or down. Let go, or “drop” the item when it is in the desired place. *Note: There are many types of content you can add via Blackboard including links, files folders, images, videos, and more. Using the Discussion Board tool, faculty can replicate in-class discussions virtually. This page shows you how to create and configure a basic discussion board and threads. Add the discussion area to your course menu by clicking the + symbol above the menu and choosing Tool Link. Choose Discussion Board from the drop-down menu, give it a name, check Available to Users and click Submit. You can learn more about using the Discussion Board. Click on the menu area you have just created. Add a Discussion Board by clicking Create Forum. Give the forum a name and set availability and other settings. You can watch a video on the Discussion Board creation process, which gives a breakdown of the various settings, on Blackboard's Help site. The new forum will appear in a list. Click the forum to create a new thread, to which students can reply. You can configure the settings so that students can create new threads if desired. For more comprehensive information, please visit the Discussion Board for Instrutors area on the Blackboard Help site. In Blackboard, you can create an “Assignment dropbox” that allows students to upload their files (Word, Excel, PDF, etc. documents) to Blackboard and creates an easy interface for grading and providing feedback. 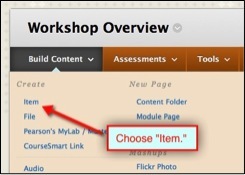 In any content area, click on Assessments and then Assignment. You must enter a name and points possible value. Optionally, you can attach a rubric or file, specify the number of attempts, due date, and availability date, and choose recipients (individuals or groups). Creating an Assignment automatically creates a column for that Assignment in the Grade Center. From your Control Panel, go to the Grade Center and choose Full Grade Center. Alternatively, you can view ungraded Assignment submissions by going to the Control Panel and selecting Grade Center > Needs Grading. Click on the student’s name next to the Assignment to view that attempt. Learn more about Assignments at Blackboard's Help site. Instructors can create basic quizzes and exams using the Test feature in Blackboard. Video instructions: To walk through the test creation process from start to finish, view the Test Creation Process Video from Blackboard's Help site. From the Control Panel > Course Tools area, choose Tests, Surveys and Pools. On the next page, choose Tests, then Build Test. Specify a Test name, description and instructions and click Submit. On the next page, hover over Create Question and choose the type of question you would like to add to your test. Page 4 of Blackboard's Question Types from Blackboard describes each type of question and how it can be used. After you add your question, click Submit and repeat the process until your test is complete. From any content area, hover over Assessments and choose Test from the drop-down menu. On the Create Test page, choose the Test you just created. Click Submit, and specify additional instructions and parameters, including availability. Click Submit. The availability settings you specified here will determine when your students see the Test. Needs Grading: Unread Test attempts can be viewed from the Control Panel > Grade Center > Needs Grading area. Click on the student's name to view his or her Test attempt. Once you view the attempt from this area, it will no longer appear here and you must access it through the Full Grade Center. Full Grade Center: The Full Grade Center allows you to view any student's test attempt at any time. You can find student Test attempts by going to Control Panel > Grade Center > Full Grade Center. Cells with ungraded Tests will contain an exclamation mark. Hover over the cell with the Test attempt you would like to grade, access the cell's contextual menu by clicking the down arrow and select Attempt. The next page will allow you to grade the Test attempt. Blackboard Help from Blackboard Help will show you how to grade Tests. Power Tip: You can use a PC-based program called Respondus or Excel to quickly create Test questions and upload them to a Blackboard Test. 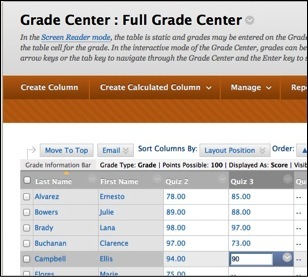 The Grade Center is an easy-to-use, powerful tool that allows faculty to enter, categorize, and weight grades and display them to students. In the event of an emergency, you can find your course roster by accessing the Grade Center. Go to the Control Panel > Grade Center > Full Grade Center. To add a graded column, click Create Column. Enter a Name and Points Possible value. All other fields are optional. To enter grades, click the cell for which you would like to enter grades, and type in the grade. Hit return. The grade will automatically save and your cursor will move to the next cell. Learn more about the Grade Center at Blackboard's Help site.